This new format 'Photosniper 3D' volume from Kagero contains 80 pages of high quality photographs and artwork perfect for the modeller wanting to superdetail one of Dragon's StuG IV kits. ... The details are often more apparent on this type of illustration than the conventional 'walkaround' photos, so if you really want to detail the interior (and exterior) of your model you will find this volume very helpful. The major part of this book involves photos of the Stug during and after the recovery, so it was in a real mess. However, after having been cleaned up, repaired and restored, it now makes an excellent museum exhibit and there are many detailed photos of the restored Stug, including some excellent interior photos. The final element of the book are some excellent colour profiles which will give plenty of ideas for modellers wanting to get the paint job right to go with all the detail you might have added having seen the book. Another very good addition to the Photosniper series by Kagero. The colour images of the restoration of the Stug recovered from the Polish river gives a good indication of the size of the task involved in a restoration project such as one of these metal monsters. 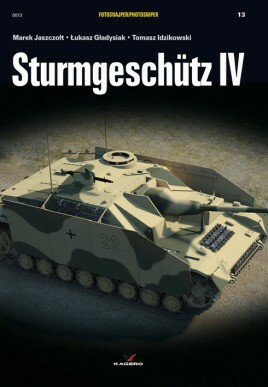 This excellent publication is the 'one-stop shop' for those requiring information on the StuG IV. ... The bulk of the book then consists of large format colour images of the museum exhibit, ideal for the enthusiast and model-maker alike.